I don't feel like I've been keeping up with these posts which fit in with one of the goals. I guess it's another thing to work on. I'm going to work through my list of categories and update how I'm doing or feeling about them. 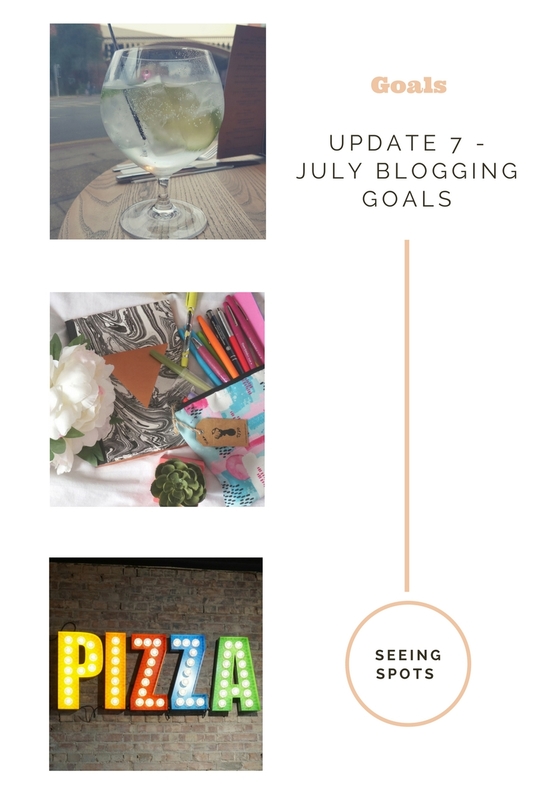 I feel that I'm focused more on social media rather than my blog or YouTube channel and it might be time to switch things up a bit for the second half of the year. It's AUGUST! How did that happen? Consistency – I'm going to say this is a little bit of a fail. I did manage to blog 6 times. Since I've been on holiday I've not really had little motivation and I have all the ideas but I haven't spent the time to write posts or take pictures. In August I want to set time aside to plan the posts and spend time over each weekend taking pictures. Engagement – I haven't been engaging with blog followers. I've had comments but I haven't read all of them yet or replied to any. How can I expect people to read and comment if I don't reply? I have plans to spend one day a week where I sit down and reply to comments. Readership ­­– I don't know if this is worded correctly anymore. I've checked my analytics and this month I've had more visitors than the last few months and while it will be nothing compared to some blogs. I bet my monthly figures are less than some peoples daily visitor counts. I'm happy and I don't feel like I need to do anything different on this one. Replying to Comments – Nope, Nope and Nope again. I haven't really put out much content this month. Again since holiday, I haven't had any motivation. I did film a lot on holiday and all this content went out but while I did film a few videos I haven't edited any or put anything else up. Reduction in posting – Nailed this one. Not exactly as planned but I'm 100% posted less!!! I'm really happy with these as while I have tried to focus on these, I've also felt like I haven't worked all that hard. What also pleases me is that I've hit some mini interim targets. I finally got to 300 on YouTube. I actually hit this twice as I reached it and within about 5 mins it was back to 297. My main Instagram reached 2000! I find it really hard to get to round numbers on Instagram, as soon as I get close people unfollow. I've been told IG has a weekend clear out of spam but even so it's been a toil! I did work at building my followers and it seemed to fly past 2000 into the 2030's but it's dropped again. I haven't posted as much in the last few days so I'm happy to stand the loss. Twitter which to be honest I tend to leave alone reached 3500. I did a little bit of work to hit this but in general, I leave it alone. People seem to find and follow me. I'm guessing there is a lot of spam accounts in that number but I'm not knocking it! Go back to the gym – I did manage to do this. I went twice and did a Zumba class each time. Then I got ill again so I'm planning another try at this in August. Read more – Yes I've been reading. I've read about 3 books in July. Mainly chick lit and I've bought a few books. I'm currently reading Hidden Figures and I'm enjoying it and want to see the film. One of the other books I've read is On the Other Side by Carrie Hope Fletcher and I really didn't enjoy it. It was a little strange and I really don't know what I make of it. Start a 2nd blog – This needs updating as technically I started this December 2016. It's about Slimming World and I don't want to promote it here but if you want the link, tweet me or follow my SW Instagram account seeingspots_sw and you can keep up to date. I rejoined SW 5 weeks ago and I have been updating that blog. I'm trying to do a weekly post after I've been to class. I'm not sure if I want to concentrate on the big number and get them to 100% or focus on the low numbers. As I've said a few times from now till the end of the year is content creation. I'm going to aim for one or two posts a week on each platform. Looks like you've had a great month! 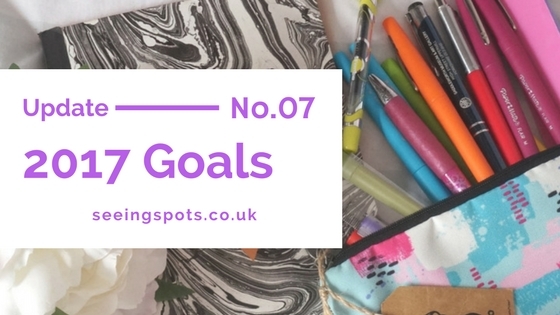 I always plan on making little goal posts like this, whether blog related or not, but never stick to them and fed up of feeling guilty because of them! Good on you for sticking with it and keeping up with the goals you set! Go for it. This is the first year I've managed to stick with anything goal related. I think I need to set my laptop from banning the work Holiday I feel like I type it so often!!! Glad I'm not the only one. I really should be taking photos right now! Sounds like you've had a great month. Setting goals is a great way to see how far you have come! What's the name or link to your second blog? I love that you set yourself monthly goals this is something i need to try and do. Sounds like you are on target. This has given me motivation to set targets for myself! Congrats on reaching 2000 on Instagram! I find for me, it's the hardest platform to grow. My 2nd blog isn't one that I will be publicly sharing or promoting. It's more of a diary so while this blog is a hobby the other one is a hobby from my hobby!!! It isn't always easy to be consistent with posts. I hope you have more time to respond to bog and YouTube comments soon. I always feel so bad when I don't reply and I'm working backwards to try and get back to everyone. Luckily I don't get that many comments!! It's great that you have clearly defined goals and success criteria. I hate it when followers/subscribers goes well and then dips, so frustrating! Good you have clear set goals you want to hit. Good luck with them all.